In stories about the massacre, the mothers of the victims always play a big role. They are the ones who lost their sons, a few of them their husbands. They walk, stand and sit at the front, holding pictures of the ones they lost, all photoshopped into beautiful landscapes. It is their pain that matters the most. The pain of the young men of the two villages the victims came from, Gülyazi (Kurdish name: Bejuh) and Ortasu (Kurdish name: Roboski) is hardly ever mentioned. Maybe because they are supposed to be strong, young and resilient enough to handle the loss of their brothers, friends, fellow villagers and class mates. Maybe because the pain of young men is not as appealing to the public as the tears of mothers. Most probably also because their activist way of dealing with the massacre is related all too often with their support for the PKK, and in Turkey that means for terrorism. 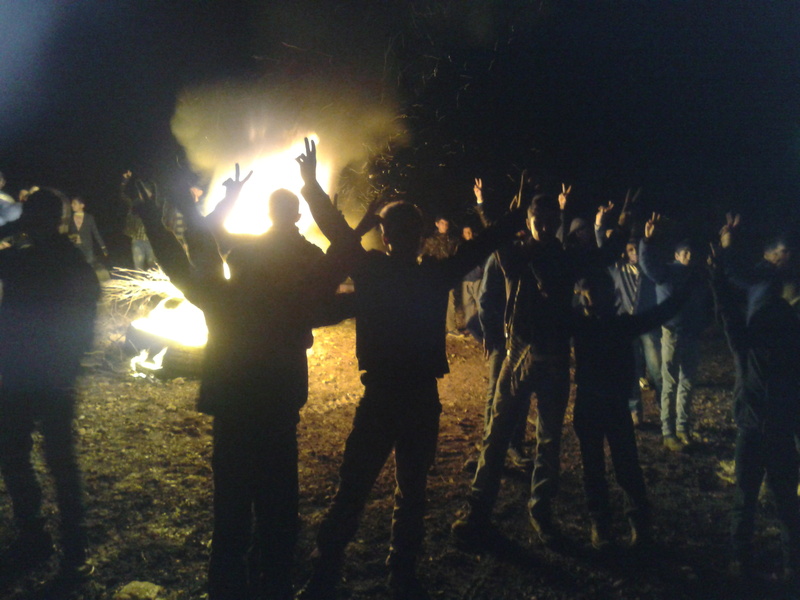 Young men next to a fire they made by the graveyard of Gülyazi, Friday night 27 December 2013. However, at the commemoration the young men, often still teenagers, play an important role. It started on Friday after sunset. Young men grouped together on a bare piece of land beside the graveyard where the 34 victims of the massacre were laid to rest. They made a fire of truck tires. There was a microphone and a loudspeaker, and two of them gave speeches. Expressing their gratitude for the attention the massacre has been given, vowing not to rest before the perpetrators are found and judged. These young Kurds don’t weep like the mothers. They express their sorrow and anger by playing music, by chanting slogans (‘Murder state, give account!’, ‘Roboski will become the grave of fascism!’, ‘leader Apo!’), by singing activist songs with their hands forming V-signs in the air, by throwing yet another tire on the fire to make it flare up some more. Many of these young men contribute to the income of their families by smuggling, just like their peers who died that night in the massacre. It could have been them that night, crossing the border for trade to save up for a computer, a new coat or shoes, or just to help their parents make ends meet. The faces in the pictures that the mourning mothers hold could have been theirs. What is it like to live with that reality? The next day the official commemoration started at the graveyard. The local Imam took the lead with prayer in a packed cemetery. Four BDP and HDP members of parliament – Selahattin Demirtas, Gültan Kisanak, Sebahat Tüncel and Ertugrul Kürkcü – are present too, all four of them giving speeches later from the roofs of shops, clearly visible to everybody. ‘Today we ask Erdogan again’, says Kürkcü, ‘Were you the one giving the order? 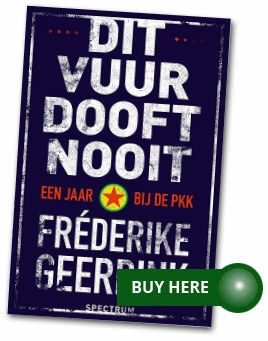 Are you the murderer?’ A bit later Demirtas has the answer: ‘It was Erdogan who gave the order to bomb’. He said it in 2012 too, during the first commemoration, but then in other words: ‘This massacre bears the fingerprint of Erdogan’. The Roboski massacre doesn’t play a big role in the peace process that is officially still ongoing between the PKK and the government. Nevertheless, it is important, also in a symbolic way. Experience in other countries hasshown that such grave human rights violations can only be independently and thoroughly investigated when the system that was responsible for it has been abolished. Look at Bloody Sunday, Northern Ireland, in 1972. Fourteen unarmed protestors died of police bullets. The massacre was only really investigated after the system that caused the massacre came to an end in 1998 with the Good Friday Agreement. The same goes for the Soweto uprising in SouthAfrica in 1976, in which at least two hundred protesting school children were killed by a randomly shooting police force. This massacre was only investigated properly after the apartheid regime was abolished in the early nineties. 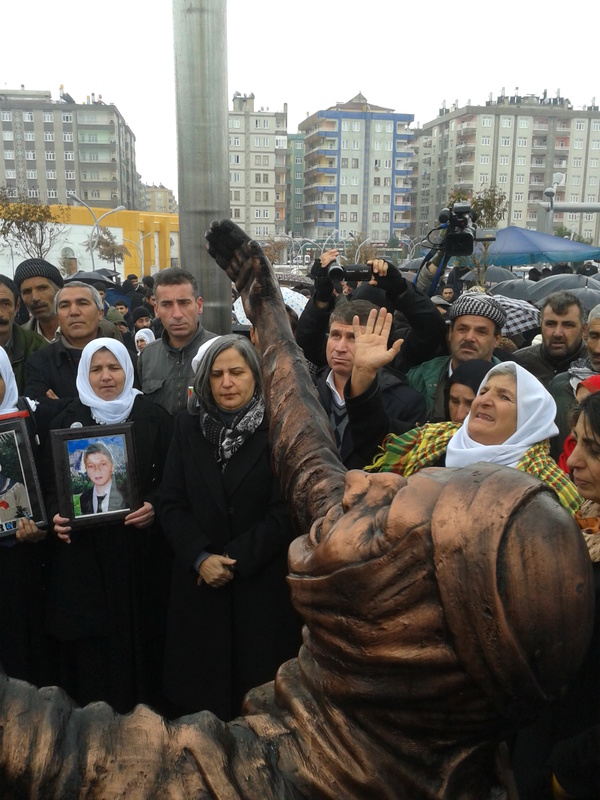 The unveiling of the Roboski massacre monument in the presence of mothers from Roboski and mayoral candidate for Diyarbakir, Gültan Kisanak. Diyarbakir, 30 December 2013. Likewise, the peace process in Turkey has to reach an agreement before the Roboski massacre will be properly investigated and before a government leader can genuinely apologize for it. Until then, the commemoration will remain as it is: an emotional and political call for justice, in which people cannot find a sense of closure. That evening there is another big fire next to the grave yard. Again there are young men, but now most of the mothers are there too. They sit by the fire, protecting themselves from the thick mud by sitting on stones and pieces of cardboard. They hold the portraits of their murdered sons in front of them. The young men take the lead. Speeches, singing, slogans. Two days later, on Monday 30 December, a monument remembering the victims of the Roboski massacre is unveiled in a park in Diyarbakir. Several mothers who lost their sons are present. They remove the cloth that was draped over the monument: a desperate mother, kneeling down, crying with her hands in the air. Around her, high above her, war planes. On the side of the black platform that she kneels down on, the names of the 34 victims are written. None of the young men of Roboski are present. It is just another Monday for them, and they are in school. Studying to maybe improve their lives. Getting ready for a hopefully safer future.